Have beautiful, thick, long hair – now! Why wait for years, when you can have beautiful long hair in just 1 – 2 hours? You may wish to create added volume and body to fine hair, make short hair longer, add colour highlights to enhance your natural hair or simply add a stylish and fashionable hair accessory. Our hair extension specialist, Adele, can identify and recommend what styles will be most suitable for you by looking at your facial shape. “I was asked by Daryl to review the market for the best human hair extensions that I could find. I did some extensive research into the latest sources of human hair extensions and was very impressed with what is available. 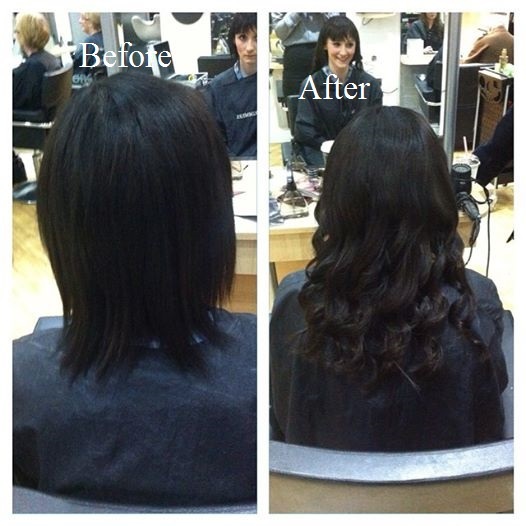 We can now offer you a selection of high quality hair extensions which are also very affordable”. We find that with the higher quality human hair extensions, the hair cuticle is left undamaged. With many brands of hair extension, the hair has received extensive chemical treatment and the cuticle is often damaged as a result. When human hair extensions are chemically damaged we can find that the hair becomes ‘knotty’ and difficult to manage. 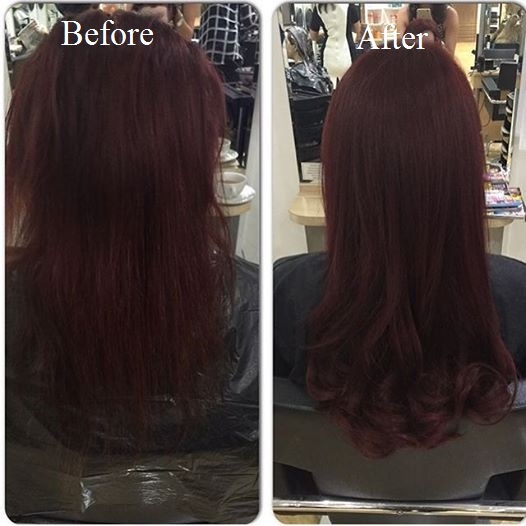 Says Adele “Our human hair extensions can be straightened, curled and coloured. They stay in terrific condition and last probably three times as long as standard hair extensions, without costing a huge amount more. They are definitely very good value”. 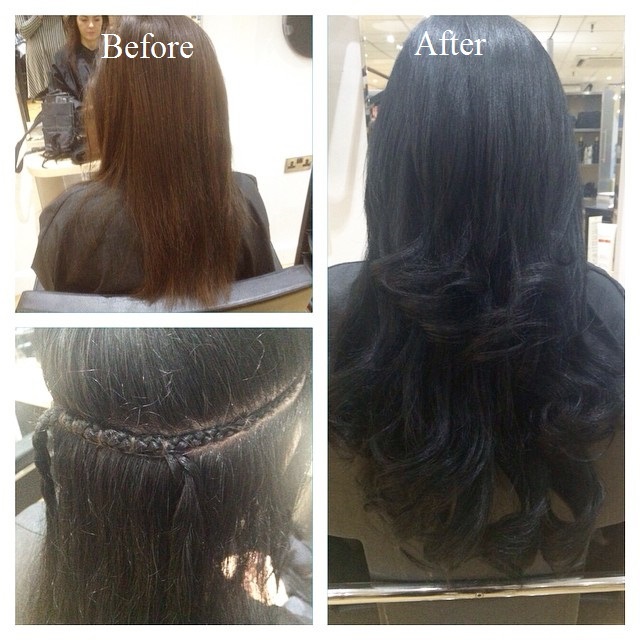 Our specialist stylists have been trained in human hair extension technology and application. A corn row weave pattern is introduced into your hair and the weft of extension hair is then sewn to the corn rows. This system is unnoticeable because the natural hair is braided into the corn rows and cannot be seen. We do not use adhesives or heat in this process, so no damage is done to your natural hair – we simply achieve a safe, great looking result! 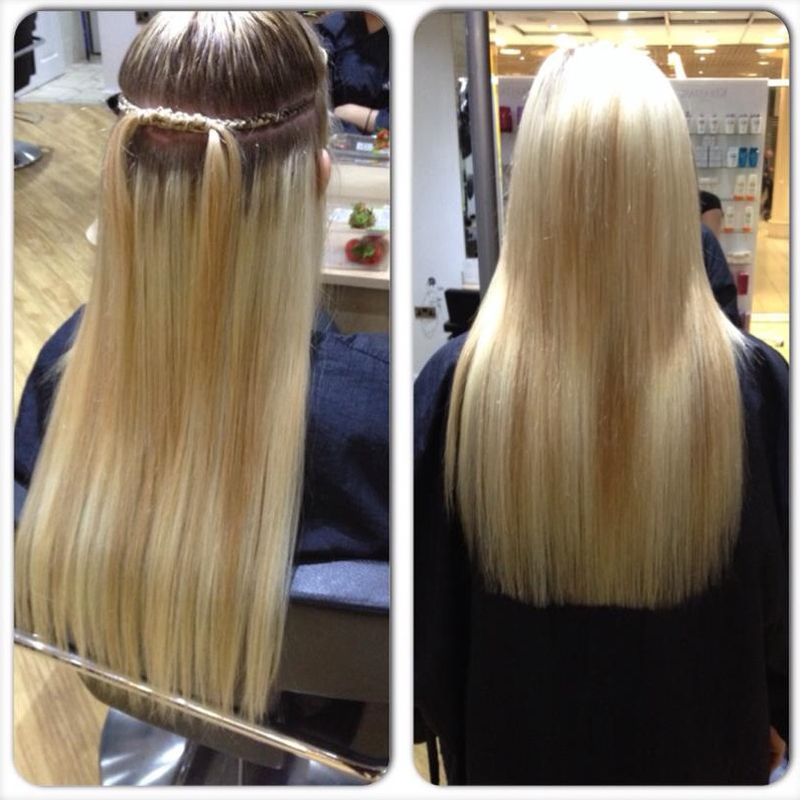 We fit your extensions, and have a full range of hair extension colours for you to select from. For rates please see our prices page and visit the offers page for the current special deal. If you would like recommendations on what type of hair would be best for you, please call in the salon for a consultation. Q. How long can I keep my hair weave in? A. Weaves can last for up to 3 months, if properly maintained by the client. Q. How should I wash my weave and what shampoo should I use? A. It is best to use a mild shampoo with a low pH. Apply the shampoo to the palm of your hand, rub hands gently together and rub into hair. Take care not to massage too vigorously to avoid extensions matting. Q. Should I use a conditioner? A. Conditioners can be used but they can clog up the base of the weave. Conditioners tend also to leave a residue on the base of the weave, so it is important to thoroughly rinse out the conditioner when used on hair extensions. It is best to use Leave-in conditioners. Q. What if my weave is too tight and causing me to have migraine? A. Rinse the hair using warm water on the scalp to help loosen tension caused by the weave extensions. If this does not help the hair extensions should be removed. Weaves that are too tight can cause tension on the follicles and break the hair. Also, tightness of the weave can cause traction alopecia, which may result in permanent baldness. It will be evident from this detail that you should always have your hair extensions applied and maintained by a trained specialist. Q. What if my weave is causing me difficulty in sleeping? A. For the first couple of nights after your extensions have been fitted, they may cause some discomfort at night. But after 2 – 3 nights they should be fine.